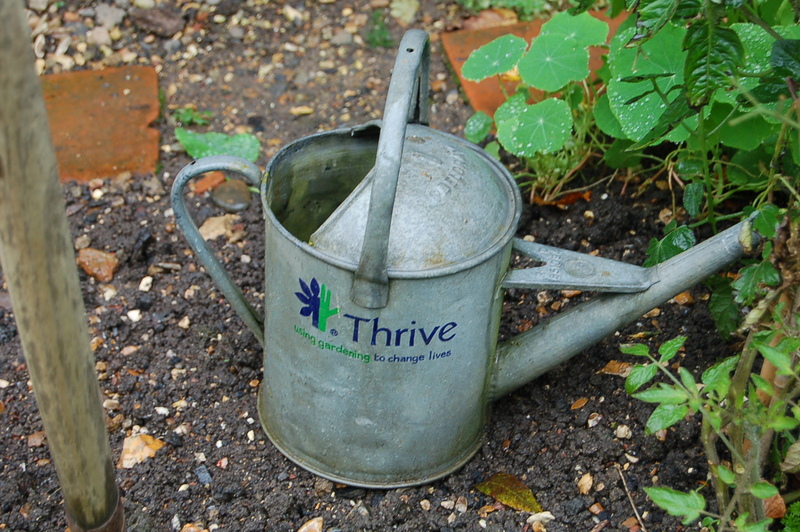 “Thrive” is such an apt name for a charity which helps people thrive in the garden and through gardening. 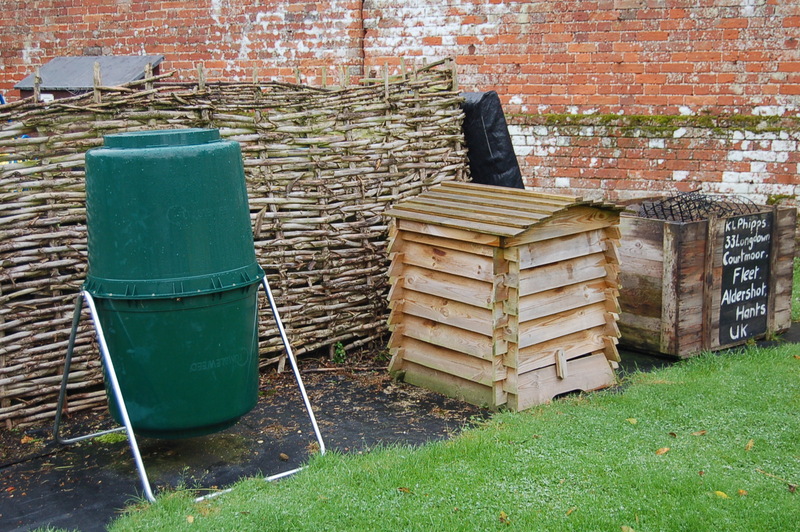 Sadly as the weather was so wet we met no gardeners at work. Apart from us and the occasional Robin, who provided the entertainment, the place was deserted. 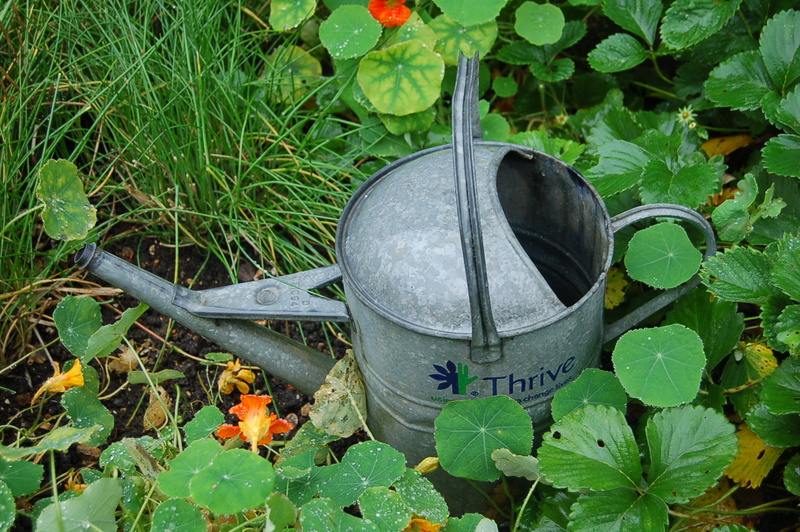 The charity looks after gardens all over the UK teaching the skills of gardening and developing a love of gardening in its clients. 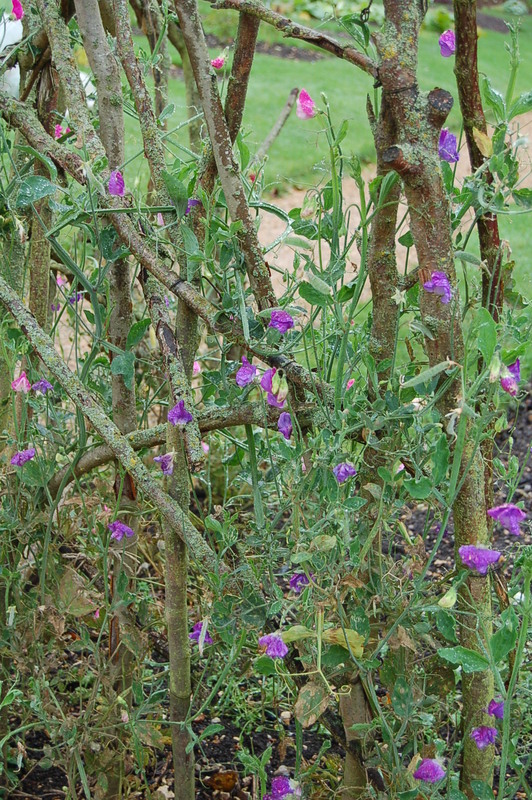 Their gardens though are there to educate others. 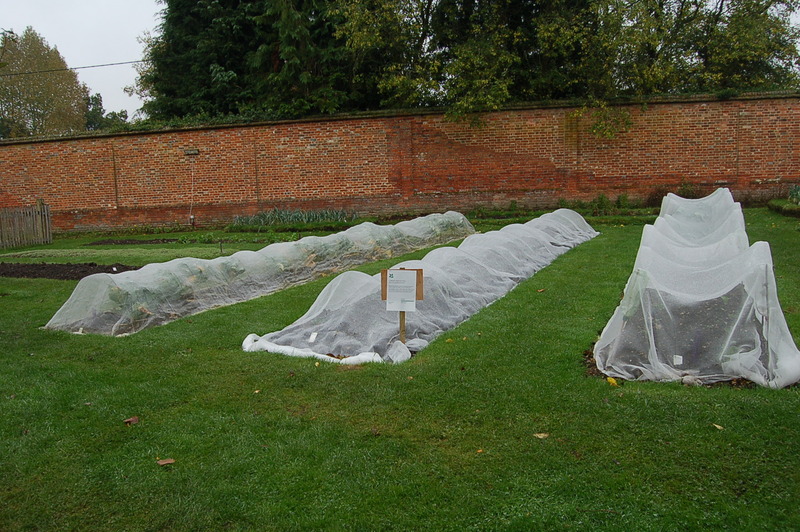 The gardening standards are very high and the gardens boast some effective educational and informative displays. 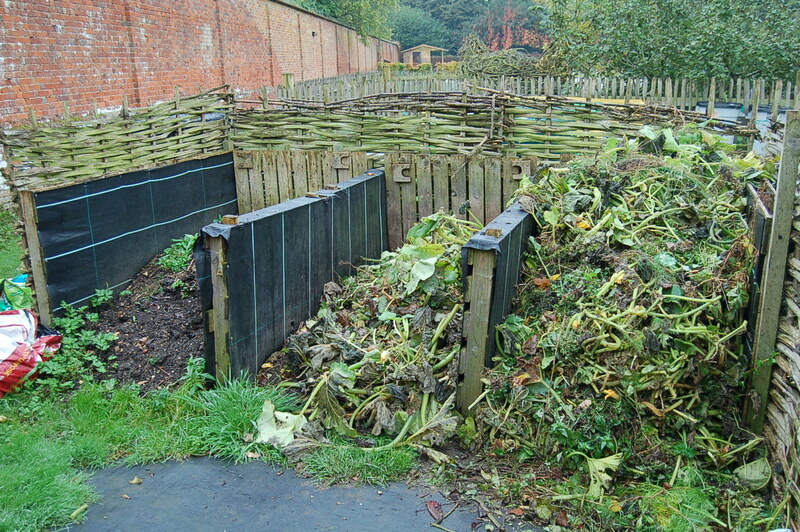 Here at the National Trust property, The Vynes, the productive garden maintained by Thrive illustrates quality techniques in action especially composting. 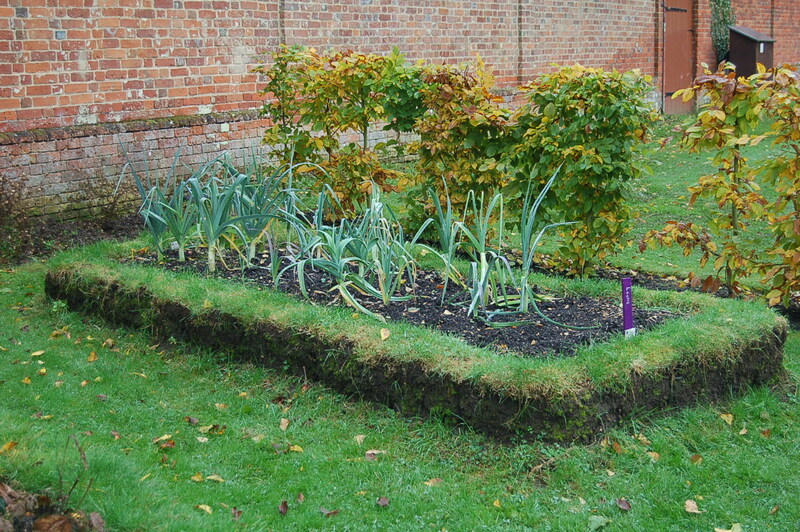 We liked these two ideas for raised beds, particularly this turf bank version, which would make gardening easier for wheelchair users or back pain sufferers (like me). 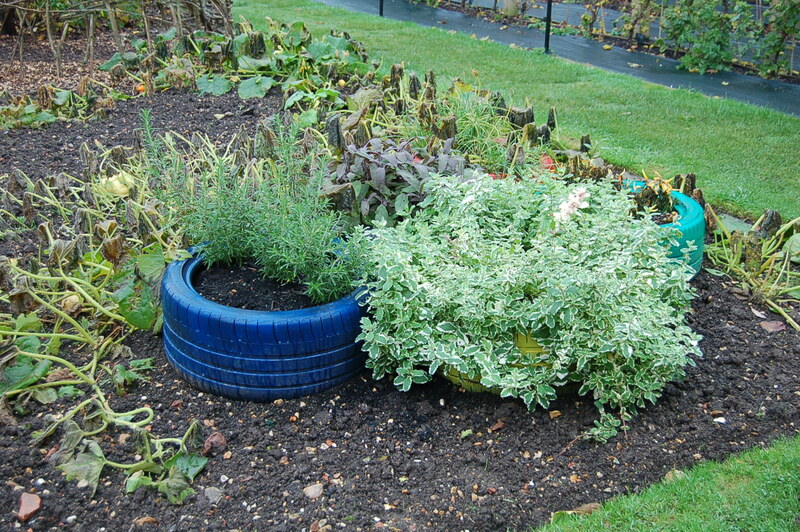 The second picture shows raised beds and recycling combined – revamped old tyres. 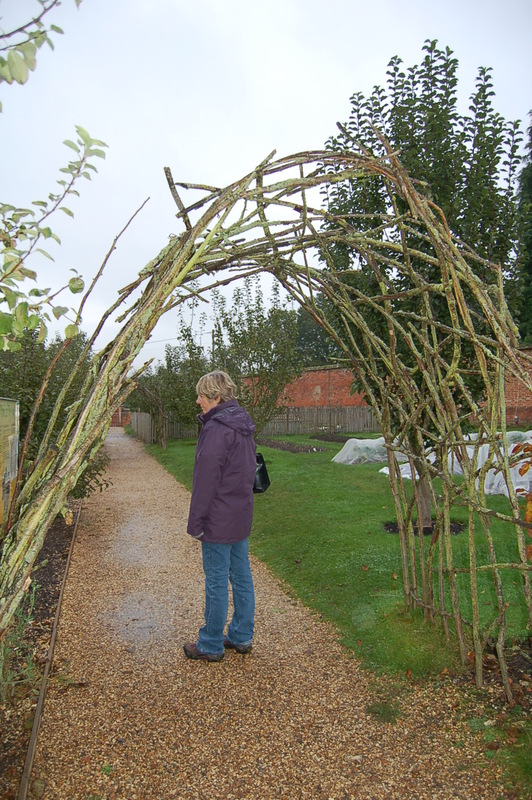 Arches constructed from tree prunings make most attractive and natural supports for climbers such as Sweet Peas and help entice you down the paths. 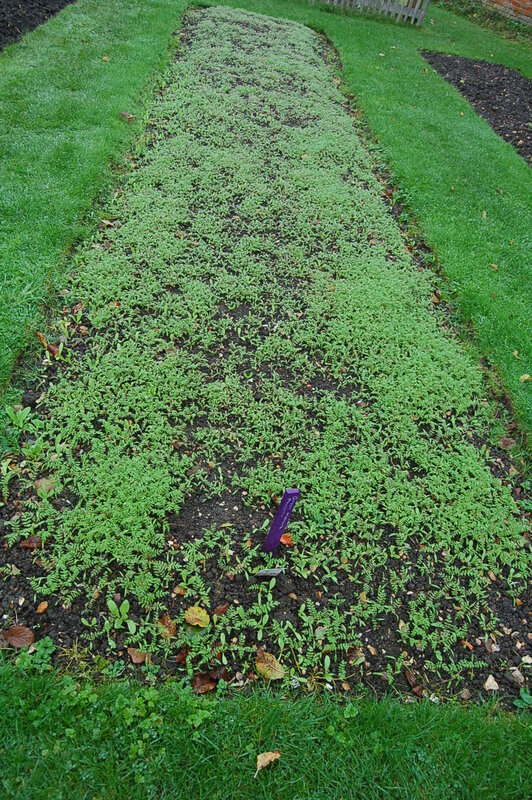 Organic ideals are followed here as well, such as using fleece as protection from pests and the cold and growing green manures such as this Phacelia. 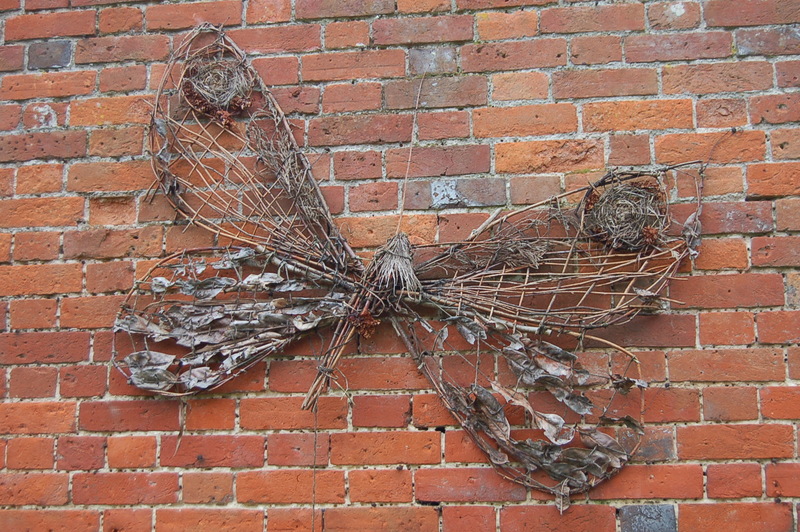 We were impressed by the use of willow as a craft material in creations such as the giant hen and the wall-mounted butterfly. 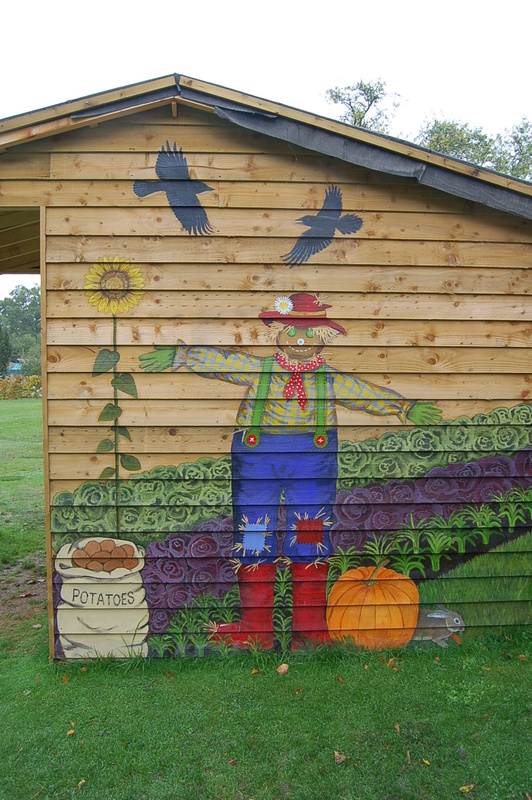 There was even a children’s garden with picnic tables topped with puzzles and a beautifully decorated shed full of special tools and games. 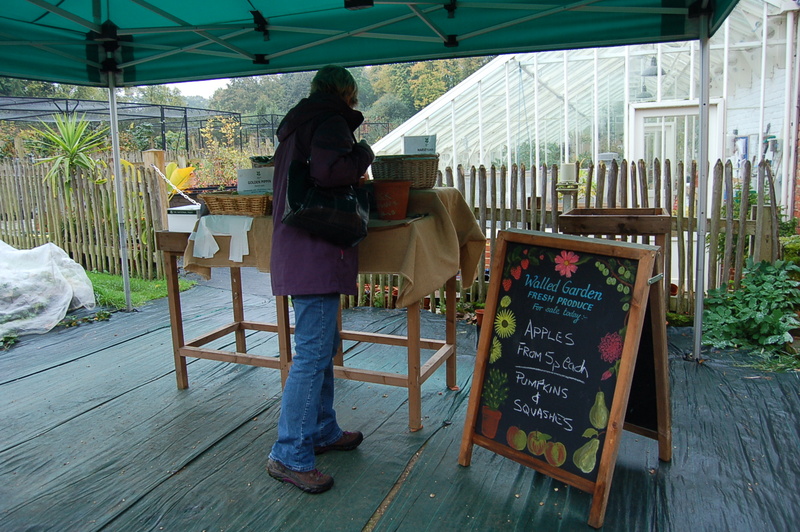 The produce from the beds are for sale to visitors and at this time of year that meant mostly apples in variety. To find out more about the work of Thrive I suggest a visit to their website www.thrive.co.uk . 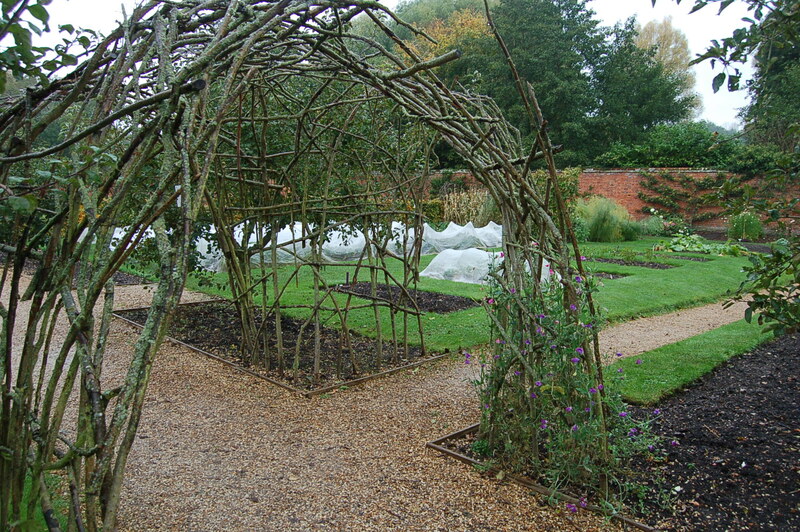 To see their work in action you can visit one of their many gardens around the country. Check it out and you will be impressed! 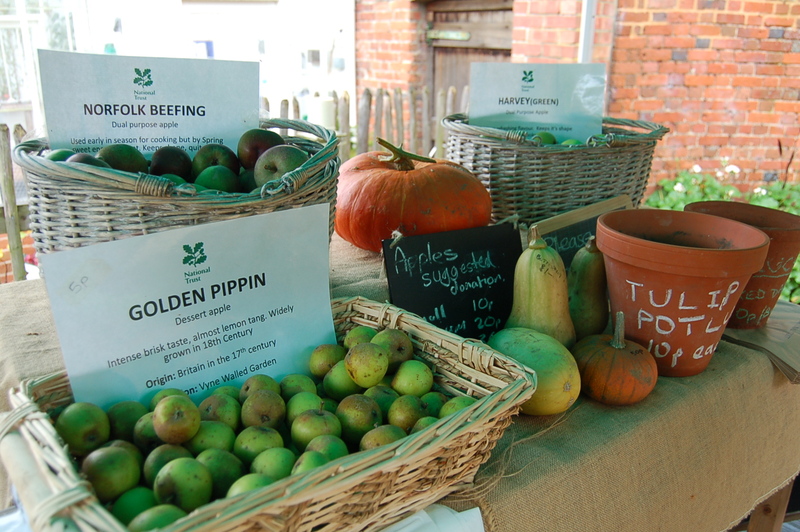 This entry was posted in climbing plants, community gardening, fruit and veg, gardening, gardens open to the public, grow your own, National Trust, outdoor sculpture and tagged apples, community gardening, fruit and veg, fruit and vegetable growing, fruit., garden charities, garden photography, gardening, grown your own, National Trust, organic gardening, the Vynes, Thrive. Bookmark the permalink. Seems like a worthy enterprise. 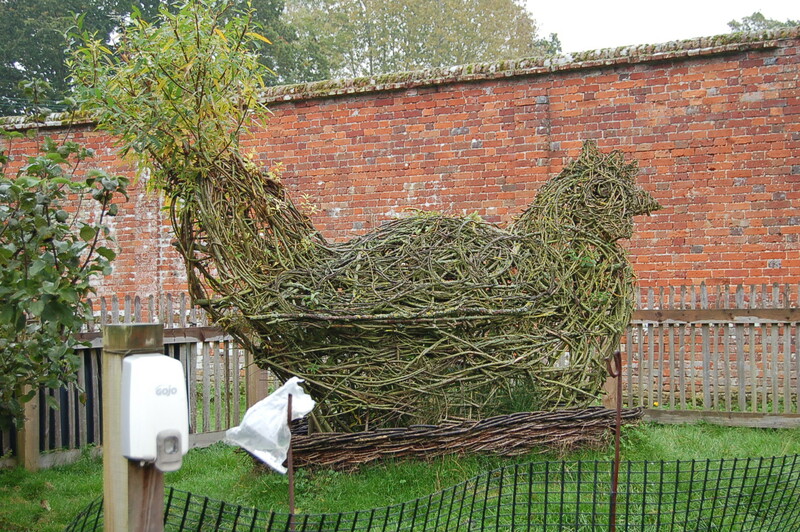 Love the willow hen. She was a mighty big hen! What a wonderful place – so many creative ideas. You guys really are lucky to have so many wonderful gardens to visit. 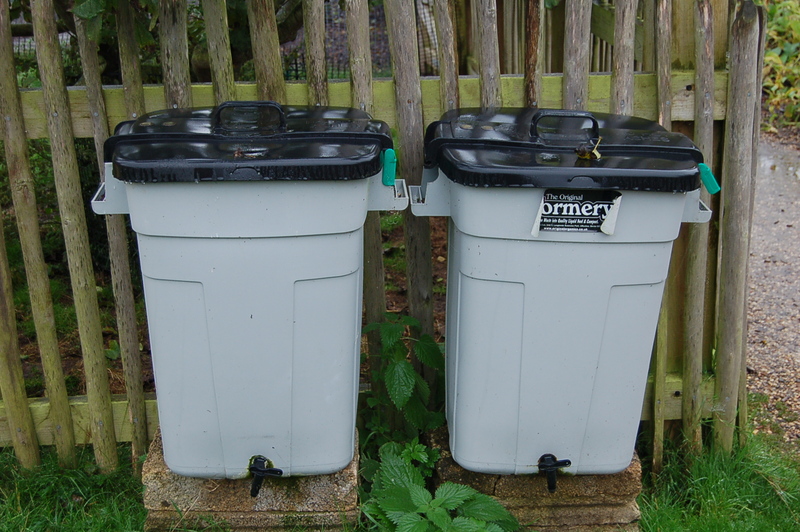 Yes, the garden was full of ideas.